‘Meatza’, a wordplay on 'meat' and 'pizza', is the perfect pizza alternative for those avoiding gluten, following a paleo diet, or when you simply fancy something a little bit unique. Replacing dough with ground beef is a simple and fuss-free way to create a tasty vehicle for all your favorite pizza toppings. All you have to do is combine ground beef with eggs, oregano, sea salt, and black pepper; flatten into a disk and brown in the oven. Then top it with a beautiful homemade tomato sauce and fresh toppings! The sky is the limit as far as toppings for this meatza go. Try sliced roasted peppers, thinly sliced proscuitto, and sautéed cremini mushrooms. For a different Mediterranean spin, try half ground beef and half ground lamb for the base and top with goat cheese slices, roasted garlic, and a sprinkling of sumac and za'atar. Serve this meatza with a glass of Pinot Noir or Chardonnay and a green salad for a complete meal. Per Serving: 750 calories; 50g fat; 27.7g carbohydrates; 51g protein; 228mg cholesterol; 659mg sodium. 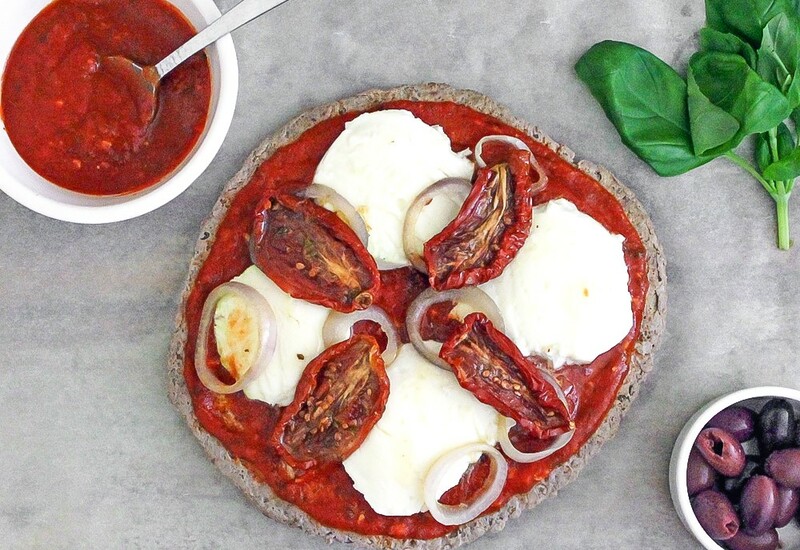 Love this paleo pizza! My husband has been trying a paleo diet so I decided to make this for him. He loved it! The homemade sauce was also really delicious. Store bought Italian seasoning worked great for us, but I am sure you can create your own seasoning mix as well. I really liked the ground beef base, it was definitely unlike anything I've ever tried before, and had a great texture and taste. Roasted sliced peppers were the perfect topping. I'd definitely make this again.